𝐃𝐞𝐟𝐞𝐧𝐬𝐞𝐥𝐞𝐬𝐬 𝐇𝐞𝐚𝐫𝐭𝐬, 𝐛𝐨𝐨𝐤 𝟐 𝐢𝐧 𝐭𝐡𝐞 𝐓𝐞𝐧𝐝𝐞𝐫 𝐇𝐞𝐚𝐫𝐭𝐬 𝐬𝐞𝐫𝐢𝐞𝐬 𝐛𝐲 𝐌𝐞𝐚𝐠𝐚𝐧 𝐁𝐫𝐚𝐧𝐝𝐲 𝐢𝐬 𝐍𝐨𝐰 𝐋𝐢𝐯𝐞 !!! After months of silence, here she stands on my front porch, waiting to be let in again. But it’s the same play every time, and I know how this ends – I give her all I have and she carries it with her on the way back to him. I should turn her away, but I won’t. Couldn’t do it if I tried. Because no matter how many times she pops back up, pulls me in and drags me under, it will never be enough. I’ll always want more. And she’ll always choose him. 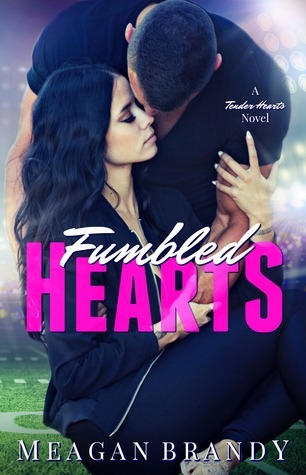 FUMBLED HEARTS IS ON SALE FOR $0.99! best friend and words are her sanity. Looking forward to reading this!! Sounds so good!